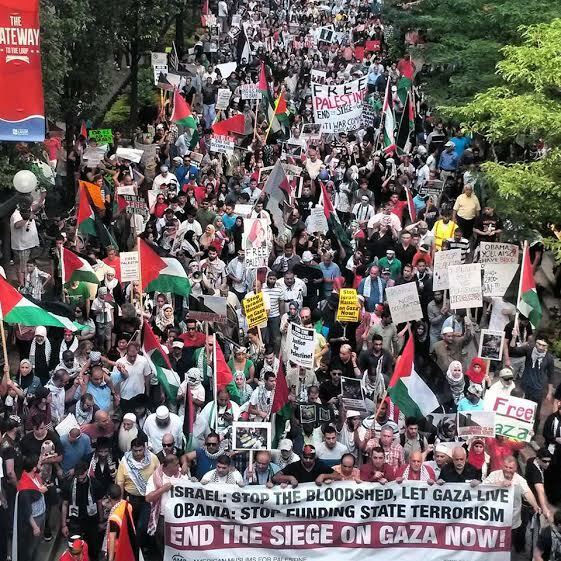 10,000+ fill streets of Chicago protesting Israel’s assault on Gaza | Fight Back! Chicago, IL - Over 10,000 marched here, July 20, to condemn Israel’s murderous assault on Gaza. The protest began with a die-in of young people. They held the names of Palestinian civilians who have been killed. The names of all the over 400 dead were read. One of the readers was Ahmed Hamad, a member of Students for Justice in Palestine-Chicago, who lost six family members in Gaza when Israel bombed their house. The marchers filled the streets for ten blocks with a sea of Palestinian flags. “After two weeks of protesting, this is the largest protest in Chicago and the largest in the country so far,” said Hatem Abudayyeh of the U.S. Palestine Community Network, who co-emceed the rally.